On Friday, April 6, at 11 a.m., the Pekin Public Library will present the fourth video in its Illinois Bicentennial Series in the Community Room. As the nation this month marks the 153rd anniversary of the surrender of the Confederacy that ended the Civil War, the video will be “Illinois’ Memory of the Civil War,” 29 minutes in length and produced by the Illinois State Archives in 1992. Admission is free and the public is invited. 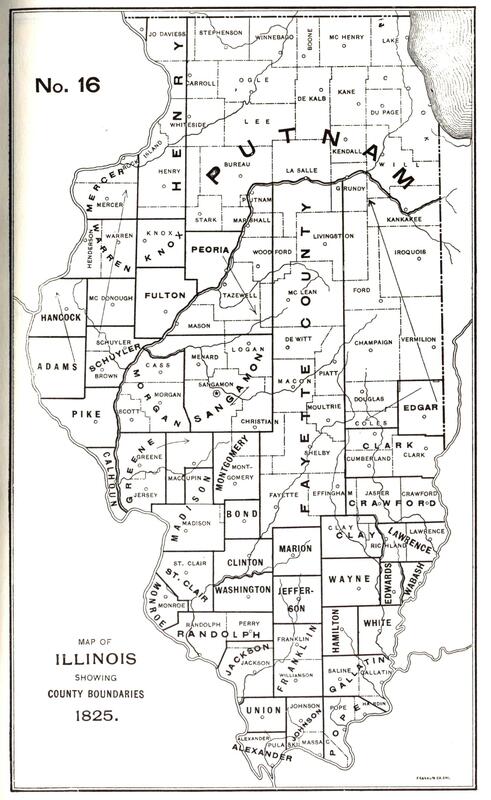 The formation and naming of Illinois’ 102 counties, which we have been tracing in recent weeks, was completed two years before the outbreak of the Civil War. Last time in this series, we had reached the year 1833, when Champaign and Iroquois counties were established. Six new counties were added three years after that: Kane, McHenry, Ogle, Whiteside, Will, and Winnebago counties. 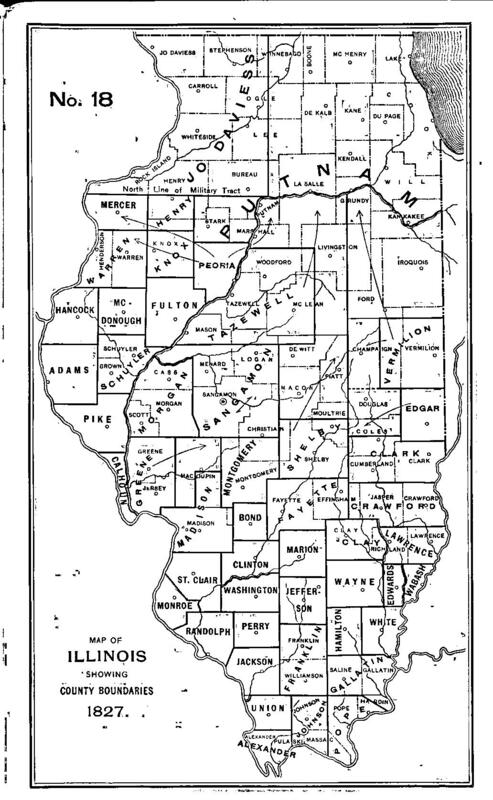 Kane County was named after U.S. Senator Elias Kane of Illinois (1794-1835). McHenry County was named for Major William McHenry, (c.1771-1835), an Illinois legislator who had fought in several battles against Native Americans. Ogle County was named after Joseph Ogle (1737-1821), an Illinois pioneer who co-founded Illinois’ first Methodist congregation. Whiteside County bears the name of Illinois legislator and militiaman Samuel Whiteside (1783-1868). Will County was named after Illinois legislator and physician Conrad Will (1779-1835). Winnebago County was named for the Winnebago tribe of Native Americans who lived in Wisconsin and northern Illinois before being dispossessed and moved to reservations west of the Mississippi River. Just one year later, in 1837, six more counties were added: Boone, Bureau, Cass, DeKalb, Livingston, and Stephenson counties. Boone County was named for the famous Kentucky frontiersman and trailblazer Daniel Boone. Bureau County was named after the French fur trader Pierre de Buero. Cass County was named after Lewis Cass (1782-1866), second territorial governor of Michigan and 14th U.S. Secretary of War. DeKalb County was named in honor of Johann von Robais, Baron de Kalb, a Bavarian-French soldier who fought alongside Lafayette during the Revolutionary War and was killed at the Battle of Camden in 1780. Livingston County was named after U.S. Congressman and Secretary of State Edward Livingston (1764-1836). Stephenson County was named for Benjamin Stephenson (1769-1822), Illinois territorial delegate to Congress. 1839 was a banner year for the creation of new Illinois counties – the General Assembly erected 15 new counties that year: Brown, Carroll, Dane, DeWitt, DuPage, Hardin, Jersey, Lake, Lee, Logan, Marshall, Menard, Scott, Stark, and Williamson counties. 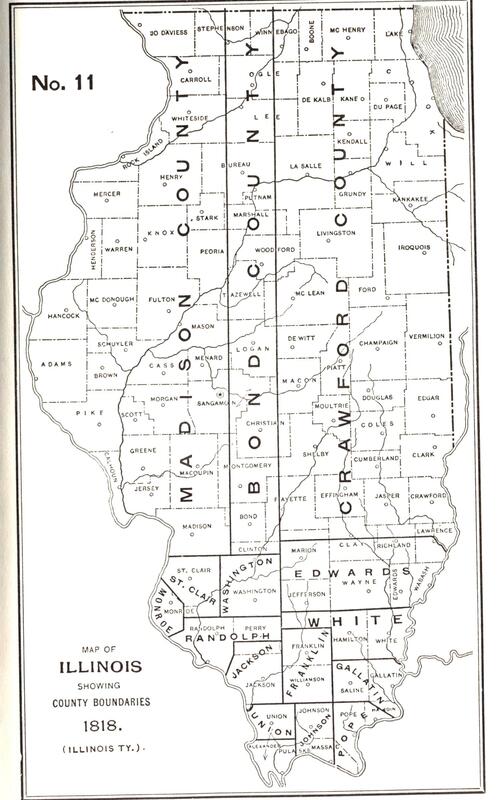 This map, from “Origin and Evolution of Illinois Counties,” shows the boundaries of Illinois’ counties in 1839, when the Illinois General Assembly created a record 15 new counties in a single year. Brown County is named for War of 1812 veteran Jacob Brown. Carroll County was named in honor of Charles Carroll of Carrollton (1737-1832), a signer of the Declaration of Independence who was the only Catholic Christian Founding Father (the other Founding Fathers were Protestant Christians, Unitarians, or Deists). As for Dane County, one may search a map of Illinois diligently but will not find it, because the county existed under that name for just one year. It was originally named in honor of U.S. Congressman Nathan Dane of Massachusetts (1752-1835), a principal drafter of the Northwest Ordinance of 1787 who personally added the ordinance’s Article 6 that banned slavery in the Northwest Territory. However, the people of the new county were Democrats whereas Dane had been a Federalist, so a settler named Daniel Goode, a Jacksonian Democrat, petitioned to have the county renamed. Dane County thus became Christian County in 1840, named after the already-existing Christian County in Kentucky, which was in turn named in honor of Revolutionary War officer Col. William Christian (c.1743-1786). DeWitt County, with its county seat at Clinton, was named for New York Gov. DeWitt Clinton of Erie Canal fame – the same man for whom Clinton County, with its county seat at Carlyle, had been named in 1824. DeWitt Clinton is the only man to have two Illinois counties named in his honor. DuPage County takes its name from the DuPage River, which got its name from an old French fur trader of the 1700s named DuPage, who had operated a trading post near the place where the river joins the Des Plaines River near Channahon. Hardin County was named after Hardin County in Kentucky, which was itself named for John Hardin (1753-1792), a noted veteran of the Revolutionary War and the Northwest Indian War who was slain by the Shawnee in Ohio in April or May of 1792. With only about 4,800 inhabitants, Hardin County has the lowest county population in the state. Jersey County was named after the state of New Jersey, from which many of the county’s settlers had come. Lake County got its name because it is on the shore of Lake Michigan. Lee County was named for “Light Horse” Henry Lee III (1756-1818), a Revolutionary War officer and ninth Governor of Virginia, father of Confederate general-in-chief Robert E. Lee. Logan County is named for Illinois pioneer and doctor John Logan, father of Civil War Gen. and U.S. Senator John A. Logan of Illinois. Remarkably, even though Illinois is known as “the Land of Lincoln,” none of Illinois’ counties are named after Abraham Lincoln – but the county seat of Logan County is named in his memory. Marshall County is named in honor of the famous U.S. Supreme Court Chief Justice John Marshall. Menard County is named for Illinois’ first lieutenant governor Pierre Menard. Scott County takes its name from Scott County, Kentucky, which was named for Charles Scott (1739-1813), a Revolutionary War officer who became the fourth governor of Kentucky. Stark County was named after Revolutionary War Gen. John Stark (1728-1822), who won a significant American victory at the Battle of Bennington in 1777. Williamson County was named for Hugh Williamson (1735-1819), a North Carolina delegate to the Constitutional Convention of 1787. Thus, by the end of 1839 Illinois had 84 counties. The Illinois General Assembly would organize the 18 remaining counties over the next two decades. We’ll conclude the roll of the names of Illinois’ counties next time. Clay County was named after Henry Clay of Kentucky, a notable American leader during this period who served in both the U.S. House and Senate, best remembered for negotiating the important Missouri Compromise of 1820 that safeguarded the nation’s fragile equilibrium between slave and free states. Clinton County is named in honor of New York Gov. DeWitt Clinton (1769-1828), who spearheaded the building of the Erie Canal that bolstered the U.S. economy. In 1825, the Illinois General Assembly established 10 new counties – the most that had been founded in Illinois history up till then. The counties were Adams, Calhoun, Hancock, Henry, Knox, Mercer, Peoria, Putnam, Schuyler, and Warren counties. 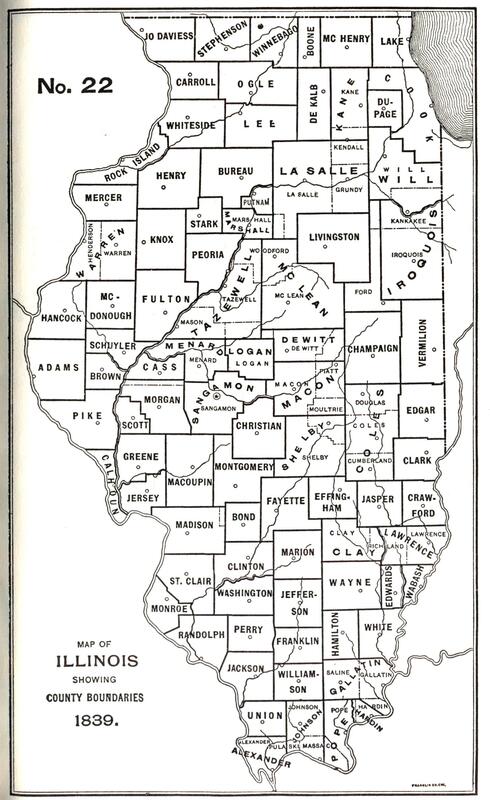 This map, from the “Origin and Evolution of Illinois Counties,” shows the boundaries of Illinois’ counties in 1825 — one year after the arrival of Jonathan Tharp at the future site of Pekin. Five of 1825’s new counties were named after men who fought in the Revolutionary War. Knox County is named for Gen. Henry Knox, who became the first U.S. Secretary of War. It is noteworthy that there had formerly been a Knox County that included parts of Illinois, back in the days of the Indiana Territory – but with the formation of the Illinois Territory in 1809, the original Knox County became an Indiana county. Illinois’ Knox County of 1825 was never a part of the original Knox County. Mercer County is named for Gen. Hugh Mercer. Putnam County – the smallest Illinois County, covering only 160 square miles – is named in honor of Gen. Israel Putnam, U.S. commander at the Battle of Bunker Hill. Schuyler County is named after Gen. Philip Schuyler, who also served as a U.S. Senator from New York. Warren County is named for an American patriot who was killed very early in the Revolutionary War, Joseph Warren. 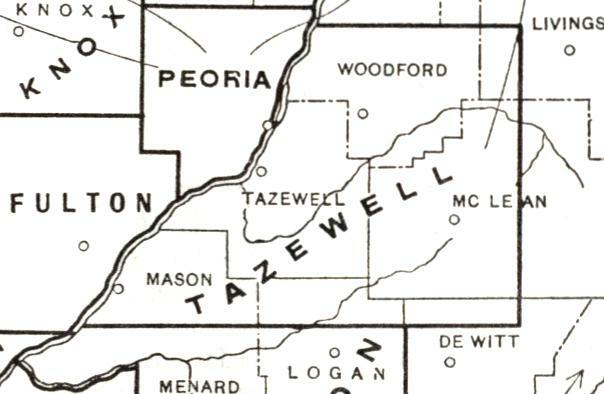 Besides Tazewell County, three other counties were established in 1827: Jo Daviess, Perry, and Shelby counties. Jo Daviess County is named after Joseph Hamilton Daveiss, who commanded the Indiana Dragoons at the Battle of Tippecanoe in 1811. Curiously, although his last name was spelled “Daveiss,” in all of the places named for him the misspelling “Daviess” is used instead. Perry County is named for Commodore Oliver Hazard Perry, who led American naval forces to victory at the Battle of Lake Erie in the War of 1812. Shelby County is named after Kentucky Gov. Isaac Shelby, a veteran of both the Revolutionary War and the War of 1812. Also founded in 1831 were Effingham County, named for Thomas Howard, 3rd Earl of Effingham, who resigned from the British Army rather than fight against the 13 colonies; Jasper County, named for Revolutionary War hero Sgt. William Jasper (c.1750-1779); LaSalle County, named after the French explorer Rene-Robert Cavelier, Sieur de la Salle; and Rock Island County, named for Rock Island, a notable island in the Mississippi where Fort Armstrong was built in 1816 and an arsenal was established in the 1880s. By this time Illinois had been subdivided into 60 counties. Another 42 counties would be established over the next 26 years. We will continue down the roll of Illinois counties next time.